The power of partnerships was almost everything when overburdened health centres in Lilongwe were caught unawares by a seemingly relentless cholera outbreak, our Staff Writer JAMES CHAVULA writes. When a frail patient from Mtsiriza, a densely clustered slum in Lilongwe, arrived at Kamuzu Central Hospital, health workers knew that the capital city was under siege. Madalitso Nkhata, who monitors disease outbreaks at the district health office, harbours fresh memories of the city’s first cholera case in last year’s cholera outbreak which was first detected in Karonga District on November 24 2017. According to the district surveillance officer at Bwaila Hospital, the patient was too weak to walk. When he was stretchered in, recalls the health worker, the man was vomiting and opening bowels and his eyes had sunken. “Cholera is tricky,” says Nkhata. “Even a single case amounts to an outbreak. Ours begun in the night of December 30 2017, when we got a report from Kamuzu Central Hospital of a suspected cholera case. The following day, we quickly assembled a district team to interview the case and collect samples from Chinsapo area where the patient came from. “For the cholera response team, there were no New Year festivities. Their focus shifted to the public health scare. By January 2, laboratory tests confirmed the health workers’ suspicion that the patient had cholera. However, this brought into question the healthcare system’s capacity to respond to the outbreak that eventually affected about 1 000 patients and killed 30 countrywide. 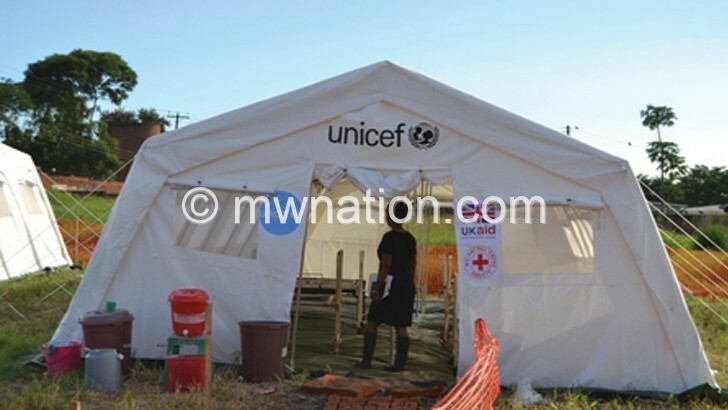 In fact, while the patient at Kamuzu Central Hospital was receiving treatment in a ten-bed tent erected in readiness for a possible Ebola epidemic, health workers at Bwaila Hospital pitched a smaller tent in readiness for more cholera cases. Nkhata recounts: “On January 5, we received one more patient from Mtsiriza and two from Area 36. The fragile situation only started improving when Unicef Malawi representative and his delegation visited Bwaila hospital and Mtsiriza. The fact-finding tour tremendously changed the way health workers were responding to the public health challenge fuelled by unsafe water as well as poor sanitation and hygiene, says Nkhata. With funding from UK Aid, Unicef instantly airlifted tents big enough for 20 patients and donated additional beds, medical supplies and chlorine for water treatment in treatment camps and at home. The consignment marked the start of “a real game changer”, according to Nkhata. “The support from Unicef was timely. It solved the main challenges. Suddenly, we could treat more cases at Bwaila where the cholera treatment centre was housing over 20 patients a day, with some sleeping on the floor,” he narrates. In Lilongwe alone, cholera attacked 388 people and killed 18. “It is undesirable that the country experiences cholera every year. This is why Unicef Malawi is working with government and other partners to end cholera outbreaks,” says Patrick Okuni, the acting chief of Water, Sanitation and Hygiene at Unicef Malawi. To curb further spread of the disease, Unicef supported the Ministry of Health with chlorine and mass awareness campaigns in cholera hotspots, where rapid water assessments showed all water sources, except taps supplied by Lilongwe Water Board, were contaminated and not safe for consumption. The water treatment and infection prevention supplies helped keep the public health crisis in check both in treatment camps and at-risk settlements. “Our partners at Unicef scratched where it really itched. Trends of infection revealed that most cases were caused by poor access to safe drinking water. Most water sources in Lilongwe are contaminated due to poor sanitation,” Nkhata states. Such is the power of partnership that he reckons it would have taken longer to overcome the outbreak and more people would have been infected had Unicef and other change agents not intervened speedily. “We could have had a lot of deaths and cases of re-infections in crowded treatment camps. Cholera needs a swift response because it spreads fast and kills in a matter of hours if not treated on time,” says Nkhata. Milika McDonald, from Chikadze Village along the highly polluted Lilongwe River on the outskirts of the capital city, witnessed the quick-fire nature of cholera when her husband and daughter were infected. Her husband, who operates a “bicycle taxi or kabaza” between the village and Area 23 in the city, was taken ill in the spate that reminded city dwellers that cholera is not exclusively a rural phenomenon. The outbreak exerted immense pressure on the healthcare system grappling with high disease burden, low funding and understaffing. All 58 health facilities in Lilongwe have fewer staff than required to operate smoothly. The disease that can be prevented by drinking safe water and upholding sanitation and hygeine left overwhelmed healthcare workers working day and night as they took turns in the congested treatment camps. At Nathenje Health Centre in the outskirts of the capital, some clinicians and nurses on roster faced a community backlash for skipping their shifts reportedly in protest to lack of training, allowances and infection prevention supplies. Unicef provided protective wear, preventive supplies and locum allowances for the health workers deployed to the treatment camps. Against this background, the healthcare workforce was utterly relieved when the outbreak vanished in April 2018.